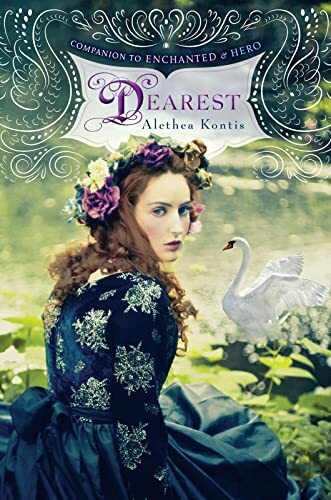 I picked up Dearest by Alethea Kontis very soon after it came out—then kept renewing my library copy, waiting for the Once Upon a Time challenge to begin. This is the third book in the Woodcutter Sisters series, with its seven sisters named for the days of the week. This book’s heroine is Friday, whose chief talents are sewing and loving others. Friday is staying at her sister-queen’s castle, helping with refugees and tending herds of children in the wake of the magical flood that swept the kingdom near the end of the last book. Friday meets a mute kitchen maid with a strange connection to seven swans—who turn out to be enchanted princes. Friday swiftly falls for one of them, and sets about trying to help the princes and their sister break their curse. If you know fairy tales, then you know this is a retelling of “The Seven Swans,” with a sister who must weave shirts to free her cursed brothers. Dearest embroiders (ahem) some extra elements on, weaving Friday into the story as a helpful friend and introducing two villainous magicians and their decidedly spooky assassin. I feel mixed about the characterization. Most of the characters are interesting and likable—I think. The trouble is that the book operates often at a surface level. Things happen quickly and characters don’t respond as much as I would like—and then when they do react dramatically it starts to give me character whiplash because their reaction is so out of nowhere. I should probably put a disclaimer here! I’m in the middle of revising my third Beyond the Tales book, and the chief thing I’m doing is giving the narrator more depth and more emotional responses. So that could very well be influencing me when I read Dearest and was muttering, “But how do you feel about this?” every few lines. Someone else (or me, at a different time) could read this without thinking that nearly as much. However—I do suspect that I would have had the same issue regardless, I just wouldn’t have been able to articulate it or explain it as well! As an example: Saturday caused the flood (in the last book) that the characters are dealing with here, a flood which drowned people, left people homeless, destroying the crops and is causing a threatened famine…but there’s a remarkable lack of blame being thrown towards the (absent) Saturday, or any sense of real trauma felt by any character because of this situation. And that…doesn’t ring right to me. This is still a fun book with interesting characters in an interesting world—but I suspect it’s a case of a middle grade book that doesn’t have as much cross-age appeal. As a younger reader, I doubt I would have been looking for nearly the same level of emotional depth from the characters. So I might caution older readers, but still recommend this for the actual target audience of eleven or thereabouts! I read the first in this series and just couldn’t take the pandemonium (plus the whole thing with the cannibalistic king seemed… a bit much?!?! ), so I’ve been scared to try the others in the series.